What: Skyrider parasailing in Cancun hotel zone. When: Daily, every 30 minutes, from 9am to 5 pm. Who: Anyone seeking for a thrilling-relaxing experience. Minimum age 6+. No experience needed. 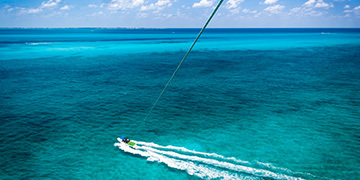 How long: 10-12 minutes Cancun skyrider parasailing. Why: We've been making people's dream to fly come true for +20 years. Sales deadline: 4 hours prior to the activity. Tickets subject to availability. Anticipated bookings recommended. Imagine soaring high above a breathtaking birds-eye view of natural sandbars, Cancun Hotel Zone, Nichupté Lagoon and Isla Mujeres. Close your eyes and imagine the gentle wind in your hair as you sit comfortably beneath the parasail gliding along on a magical parasailing adventure. Make it a reality! Our skyrider parasailing Cancun tour guarantees you adrenaline and emotion. 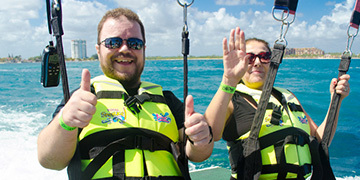 Short safety briefing prior to your skyriderparasailing cancun experience. Premium parachute cancun safety equipment. Water taxi service: we take you comfortable, safe and dry from the departure spot (dock) to the main boat. Tips for the crew are optional. Digital media photos and GoPro digital video services are available to all participants; we are the only company that records video of every flight (Optional purchase). Smile, everything is recorded!. Daily, every 30 minutes, from 9am to 5 pm. We suggest you to wear comfortable clothing, sunglasses and biodegradable sunscreen or sunblock (swimsuit and towel if you want to get wet). Playa Tortugas Location: Ideal if you’re staying at Cancun Hotel Zone or Downtown. Super easy to get on public transport (bus, taxi, uber) or rented car. Google maps location here. No requirements & no experience: No previous experience required, no dressing code, no effort or swimming needed. Just relax and enjoy, we take care of the rest! Hop aboard our boat with friends and family, with gentle take-offs and landings directly from the boat. 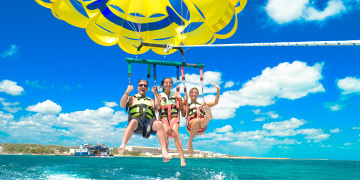 You will find this Cancun parasailing sensation to be an exhilarating yet safe way to have a true adventure. Let yourself pulled by a boat and enjoy the breathtaking view of the Caribbean sea during a 10-12 minute flight. 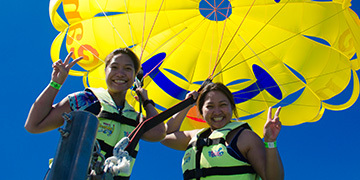 Soar up to 260 ft. in the air into the blue, blue sky with one or two other people and enjoy breathtaking views. Float on the warm Caribbean breeze. Feel the air. Our experienced and professional staff will keep you safe at all times and ensure you enjoy every moment above the crystal clear water. Our parasail activity is safe and fun for all ages! Our tour is weather dependent. Mother Nature nearly always cooperates. On days of inclement weather, enjoy your Parasail activity another day or if you prefer get your money back. 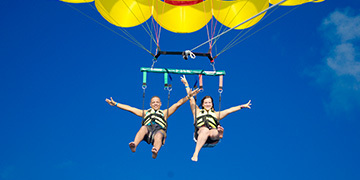 Cancun parasailing weight limit: The weight limit is 180 kg (397 lbs) either alone or accompanied. Age Limit: Only children over 10 years old can be part of this adventure (accompanied by an adult). Maximum 2 or 3 passengers per flight (according to weather conditions and total weight). The decision is up to the discretion of the captain. The maximum height of our parasail is between 80 and 90 meters, depending on the weight supported during the flight. You must sign a liability disclaimer letter and in the case of minors must be signed by an adult. We have no restrictions on any cameras or photos or video devices, however we can not be responsible for damage or falling into the sea. If you want to have the best memories of your skyrider parasailing Cancun, we recommend you purchase our package of photos and video. You will see the incredible images that we have made for you before you decide to buy it. 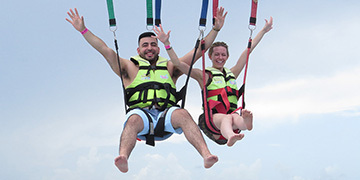 We’re skyrider parasailing cancun tour operators, not middlemen. 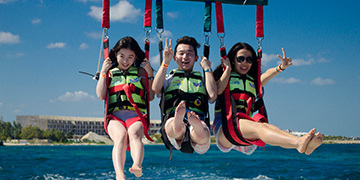 Our skyrider Cancun is enjoyed seaside always (not in the lagoon)! 100% Safe: Premium safety equipment and a great english speaking staff. Huge experience: We have +20 years making people fly! Premiere parasail company. TripAdvisor’s Certificate of Excellence w/ hundreds of reviews. No requirements & no experience: No previous experience required, no dressing code, no effort or swimming needed. Just relax and enjoy, we take care of the rest.